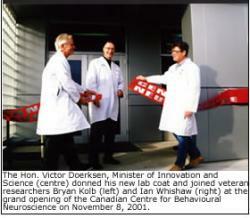 The Canadian Centre for Behavioural Neuroscience (CCBN) is a 60,000 square foot world-class research facility. At its inception in 2001, it held only 6 principal investigators and one industrial partner, NeuroInvestigations, Inc. Since that time it has undergone 2 expansions. The initial expansion completed only a couple years after opening, features two magnetic resonance imaging (MRI) units, one unit is used for small animal neuroscience research, while the other is used for human neuroscience research. The most recent expansion (2007) supports the Lethbridge Brain Dynamics group. Visit the Lethbridge Brain Dynamics website for more information regarding the facility. Read more about the recent renovations via UNews.